Anyone who has a boat with a cabin knows that funky odors tend to accumulate in the stale air of a closed-up boat. Smells generating from the head, engine room, or mold and mildew can punch you in the nose like a stinky fist when you open the cabin door after a prolonged absence. You could load up on those cardboard Christmas tree air fresheners, or you can kill the smells by destroying the offending air particles in their tracks. I was on the Boating Writers International judges panel that awarded Dometic Marine an NMMA Innovation Award at the 2010 IBEX convention for its In-Duct Breathe Easy Air Purifier. I was so impressed with the product, I convinced a friend of mine to install one on his boat.The Breathe Easy doesn’t clean the air with a filter; rather, it purifies the air in a unique way. 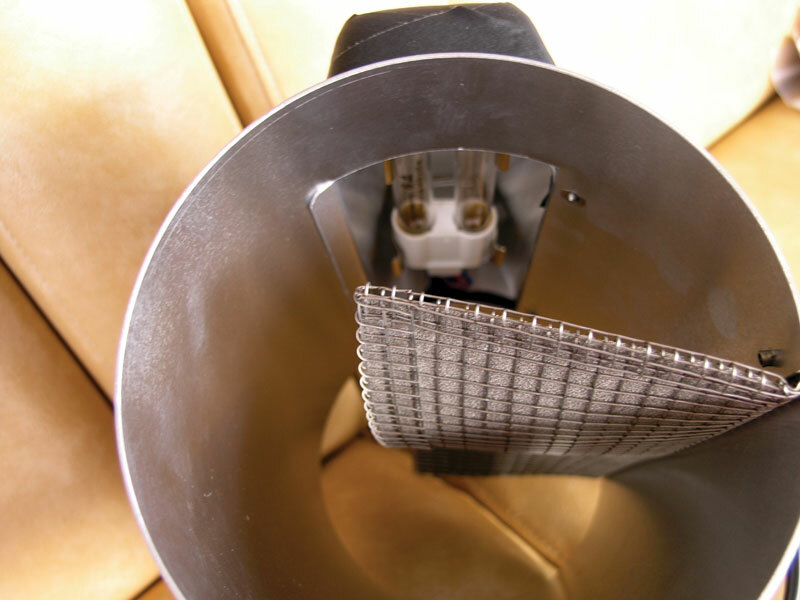 It uses a powerful twin-tube ultraviolet bulb that activates a titanium dioxide catalyst that actually converts odor-producing particles into harmless, inert material. The photocatalytic titanium ­dioxide nanomesh grid has a curved design to create a vortex of air that makes it more effective by increasing the number of suspended particles that come into contact with it, “killing” the smell. 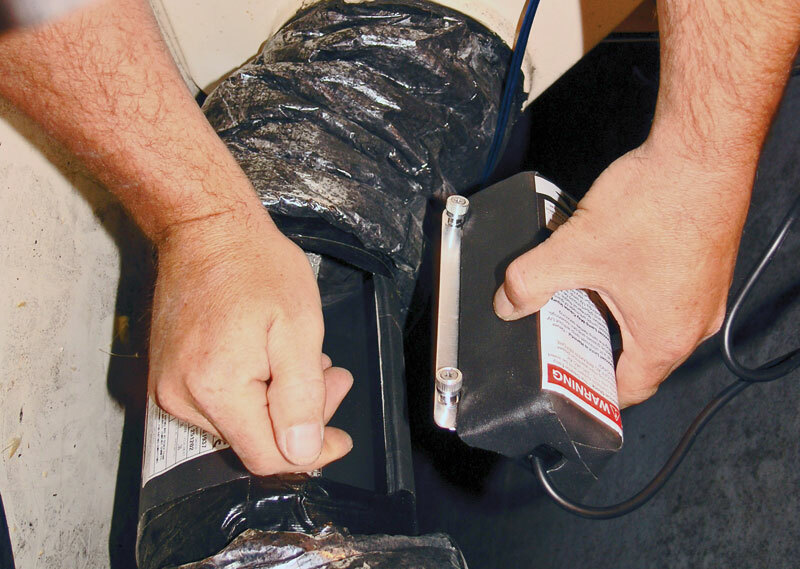 This device was tested independently by Environmental Diagnostics in Clearwater, Fla., and was found to be up to 100 percent effective at eliminating volatile organic compounds, bacteria and fungi. 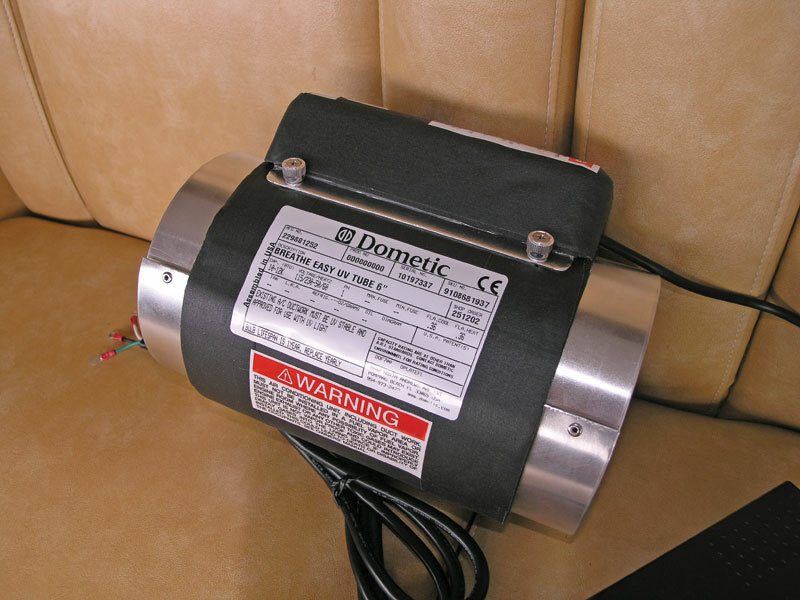 Although Dometic recommends you have it installed by an authorized A/C technician, this is a pretty simple job for someone with good hands and basic electrical skills. My friend Scott Craig is the captain of a Hatteras 67 Motor Yacht, but the beauty of the In-Duct Breathe Easy system is that it’s scalable to whatever size boat you own. His boat has six A/C units and should have at least four of the purifiers, but your Rinker 280 Express Cruiser should only need one. The install is exactly the same. These are the tools you’re going to need: a box cutter or serrated knife, duct tape, an electric screwdriver and straps for securing the purifier and controller to the bulkhead. Step 1: Shut off the breaker to your A/C unit for safety. Step 2: Locate the outflow duct nearest your A/C unit. Step 3: With your box cutter or knife, slice through the existing duct all the way through a foot or two from the A/C unit. Step 4: Although the directions didn’t tell us to do this, we removed the section that holds the ultraviolet bulb that attaches to the main unit with large thumbscrews, taking care not to touch the bulb itself. Step 5: Place the In-Duct Breathe Easy end sleeves inside the two ends of the severed duct and screw the duct onto the purifier to secure it. Step 6: For extra holding power, use tie wraps to further hold the duct over the ends of the purifier. 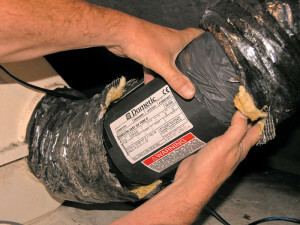 Step 7: Use duct tape to create an air-tight seal on both ends of the duct and Breathe Easy unit. Step 8: Reattach the bulb assembly to the main unit. 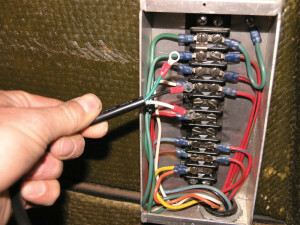 Step 10: Connect the wires to the electric box after consulting the manual to get the wiring correct. 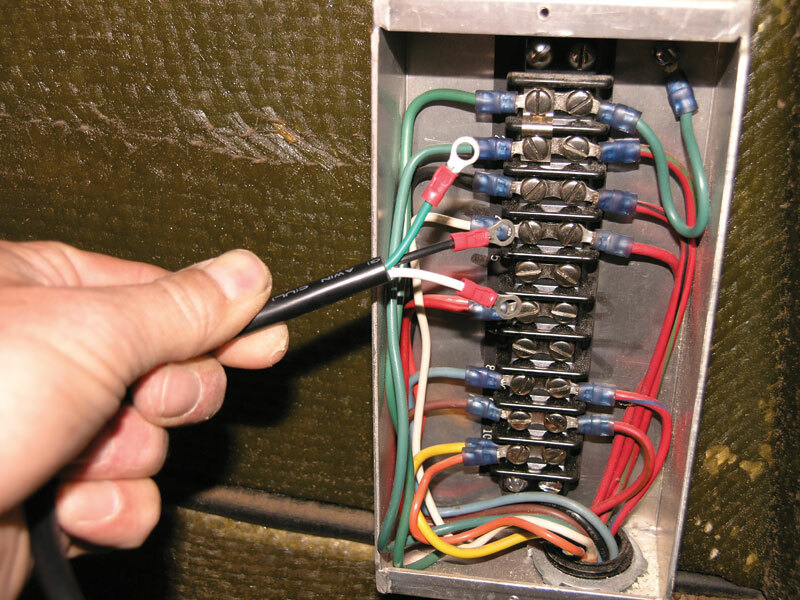 Step 11: Install the electric ballast control unit so that the blue light is visible for periodic inspection. Secure it to the bulkhead. 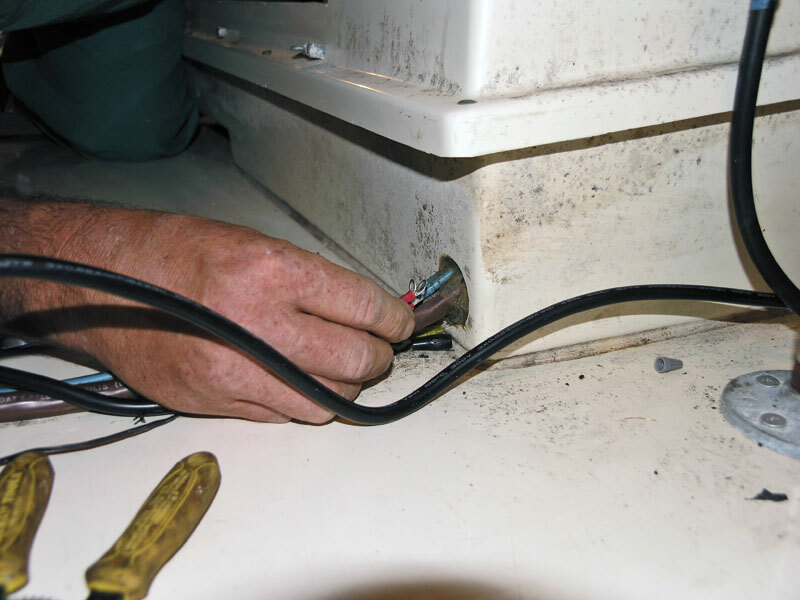 Step 12: Flip on the breaker and power up the A/C unit. You should see a blue light on the control unit and a purple glow from the In-Duct Breathe Easy unit (from the ultraviolet bulb). Also check to make sure there’s no air leakage from where the unit is attached to the ducts. the air. The unit is designed to run constantly. The bulb will need replacing about every year (wait until it burns out). The titanium dioxide nanomesh screen never needs replacing. If heavy smells are present, it will take a couple of weeks to attain maximum results. The Breathe Easy doesn’t correct the source of the problem, just the resultant odors. Locating the cause of the odor is extremely important for crew health. I visited Capt. Craig a couple of weeks later, and I could notice a difference. One sharp, unidentified smell in particular was no longer present. In more remote locations of the boat, the old smells were still there, so Craig plans on installing more units on his boat to finally smell victory. For more information go to dometic.com.